October 16 (Tuesday, 7:15 p.m.) Baseball: Personal Stories of the Game Evening Program. 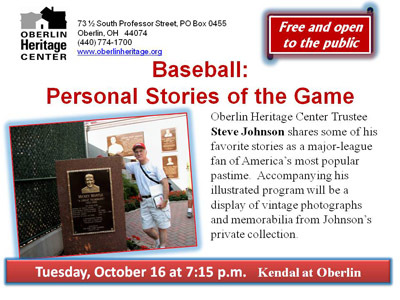 As the World Series approaches, "warm-up" with this wonderful presentation by Oberlin Heritage Center Trustee, Steve Johnson, who shares some of his favorite stories as a major-league fan of America's most popular pastime. Topics include his friendship with a major league umpire, his involvement with the Society for American Baseball Research (SABR), his volunteer work at the National Baseball Hall of Fame, and his own on-going research. Steve also talks about baseball sites he has visited and the great and not-so-great players he has met through the years. Accompanying the illustrated program will be a display of vintage photographs and memorabilia from Johnson's private collection. Location: Kendal at Oberlin's Heiser Auditorium.